level, compared to most of the Phanerozoic, found at present. Contributing to this drop was increased mountain uplift in the Cenozoic and a continual increase in solar radiation throughout the Phanerozoic. The solar increase exerted a major influence on weathering rate, helping to bring about an overall long-term decline in CO2. 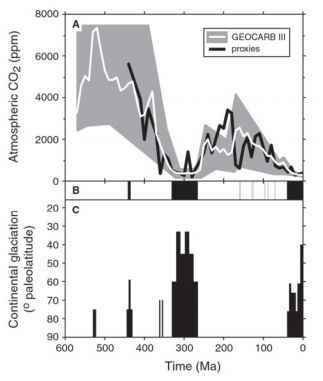 Changes in CO2 over the Phanerozoic correlate rather well with changes in paleoclimate. Times of minimal CO2 coincide with the two most widespread and long-lasting glaciations of the Phanerozoic, that during the Permo-Carboniferous (330-270 Ma) and that of the past 30 million years (Crowley and Berner, 2001; Royer et al., 2004). This is illustrated in figure 5.21. Also, periods of unusual warmth at high latitudes, such as occurred during much of the Mesozoic (250-65 Ma) correlate with periods of elevated CO2. Together these observations give support to the greenhouse theory of climate change on a Phanerozoic time scale (Royer et al., 2004). Short-lived glaciations and cooling episodes, such as occurred during the late Ordovician at 440 Ma, can be explained by other causes but may also involve short-term changes in atmospheric CO2. There are problems with all of the methods of CO2 estimation, and they have been pointed out in this and (for modeling) in previous chapters. 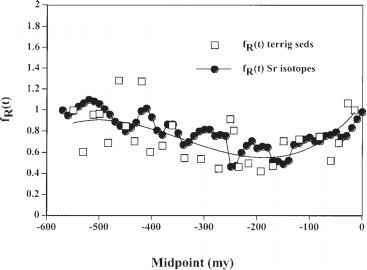 The GEOCARB standard curve is not intended to be used as an accurate CO2 measure (as is sometimes mistakenly done), but rather as a suggestion of how CO2 has changed over the Phanerozoic. New advances in the various fields that contribute to the modeling (e.g., volca-nology, biogeochemistry of weathering, tectonics, and erosion) will undoubtedly cause modifications to the GEOCARB curve, and to those of Mackenzie et al. (2003) and Bergman et al. (2003). However, the overall qualitative trend described above, I believe, will withstand the test of time. It has now stood for more than 14 years.